Thicket restoration by planting of spekboom cuttings in the Eastern Cape has, in some cases, been quite unsuccessful. In some areas a dense canopy cover of spekboom now thrives, with thicket biodiversity returning of its own accord. However, just a short distance away one might only find a handful of stunted survivors, barely clinging to life in an area with seemingly identical environmental conditions. Why this happens is a question that has left many feeling that "spekboom planting for thicket restoration is an expensive waste of time". This really is not the case, it's just that we have been somewhat forgetful and a bit hasty. So why do some spekboom die, while others thrive a short distance away? Well, a fact that is often overlooked/forgotten, is that spekboom really doesn’t enjoy the cold. For spekboom, those calm starry winter nights in the mountains that might make such great photographs of the Milky Way are an absolute nightmare. If temperatures fall near 0°C, spekboom is in real danger, and even a light frost can wipe out hundreds of cuttings. So frost kills spekboom cuttings. Is frost really killing your spekboom cuttings? 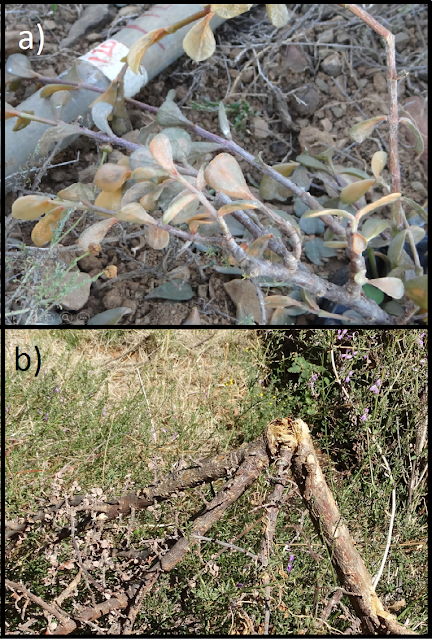 Moisture leaking from discoloured leaves, and stems flopping over (Figure 1a). This happens when cell membranes have been broken by ice crystals inside the leaves. Dry blackened leaves and stems with cracked bark peeling away in flakes by the end of winter are classic signs of frost damage (Figure 1b). Dead leaves and stems will often remain attached to the plant for a long time, giving the plant the appearance of being half dead and half alive. It is unlikely that lack of water will cause these symptoms. How to plant spekboom in the right spot to avoid frost damage and restoration failure? Simple. Don’t bother buying frost netting and trying to come up with fancy techniques, just take heed of the following three principles. 1) Avoid valley floors and flat areas. Why? 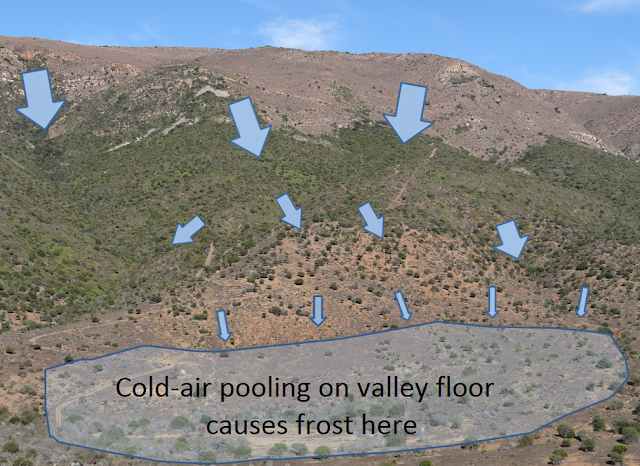 Because cold air pools (Figure 2). Cold air is denser than warm air, and on calm starry nights in winter, will flow downslope and accumulate on valley floors and in flat areas (often called frost hollows). 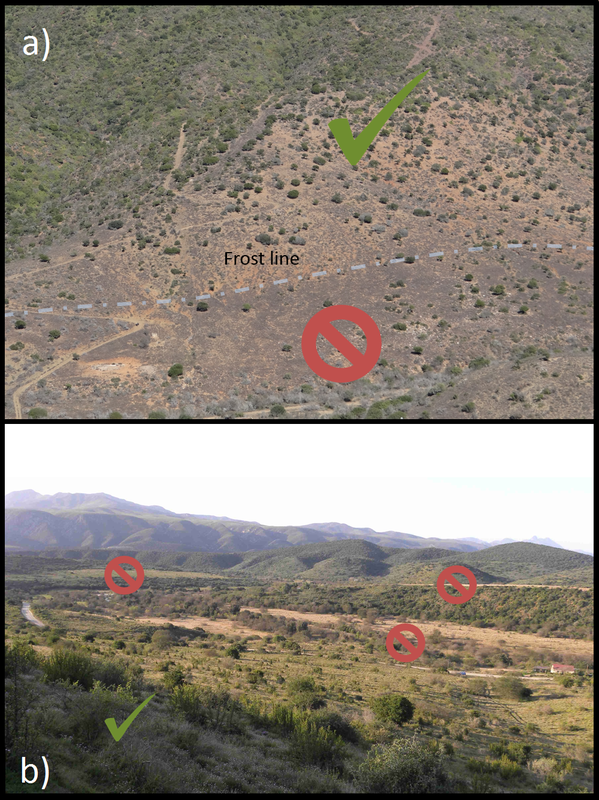 This is where frost will wipe out your restoration efforts (Figure 3a & b). 2) Hide your spekboom from the stars. Why? Because exposure to the cloudless night sky means loss of heat. Have you ever stepped under the canopy of a tree on a calm starry night? It’s often noticeably warmer underneath the canopy than outside in the open. This can be the difference between success and failure for spekboom planting. When planted underneath the sheltering canopy of not only trees, but even small shrubs, spekboom can survive in areas where frost kills those planted in the open. The insulating microclimate generated by the nurse plants canopy is the cause of this frost exclusion. 3) Nurse plants are great. Why? Because nurse plants protect spekboom from the cold (and also from herbivores). Even on frost-free valley slopes, temperatures may fall to just a few degrees above zero. Spekboom doesn’t even like temperatures below 5°C, and the insulation of nurse plant canopies can protect cuttings from unnecessary stress. Survival and growth rates will be much higher inside bush-clumps, which will in turn benefit from the presence of spekboom, as it improves the soil quality under the canopy. In summary, plan before you plant! Don't plant on valley floors and flat areas (and sometimes even on gradual slopes), and use nurse plants as much as possible!